We’re not talking about inflating your tires in this article. There is also another kind of pumping. 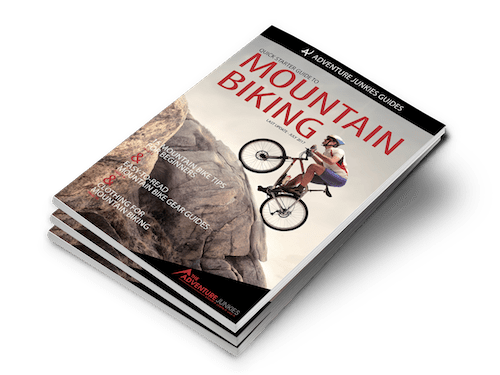 It is a technique that will make you a better rider and in this article we want to teach you how to pump a mountain bike for more speed. Pumping as a technique is the act of driving your bike into the ground to gain traction and speed. 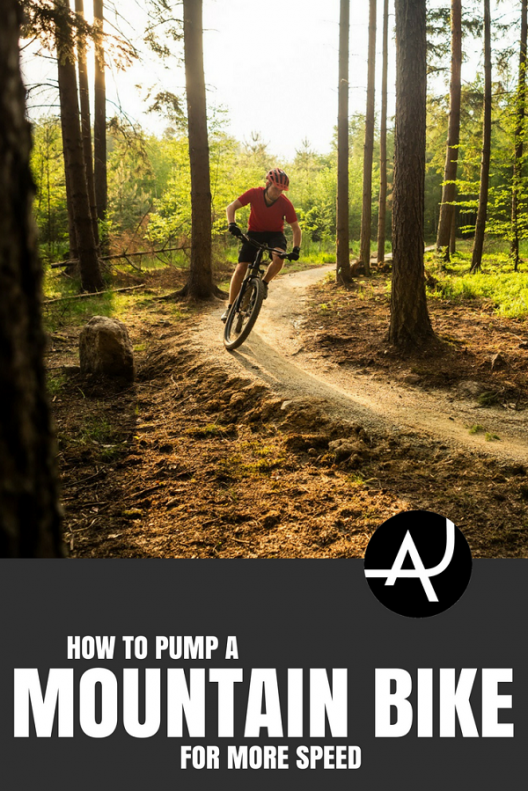 Learning how to pump will allow you to stop passively rolling over trail features and instead use them to gain speed. By forcing the tires into the ground, you will have greater traction in corners. Obstacles that previously slowed you down will become opportunities to speed up. Soon you will be pumping off all sorts of trail features and blasting through the woods. Pumping is a technique to increase or maintain speed as well as increase traction by driving the bike into the ground. It is a bit like free speed as it allows you to speed up without pedaling. Imagine throwing a basketball at a plank of wood angled at 45 degrees. The ball will bounce up and forwards. The harder you throw the ball, the faster it will bounce off the wood. Now imagine the plank of wood is a small rise on a trail and the basketball is your bike. By pushing your bike into the face of the rise, the rebound energy from your tires and suspension will push you up and forwards, helping you to maintain speed rather than the rise slowing you down. Pushing your bike into the down-slope on the other side of the rise will speed you up. This is called pumping. If you come across a dip on the trail, you can pump into it to speed up. Pumping through flat corners will push the tires into the ground, increasing their footprint and the depth that the profile digs in, both of which will give you more grip. On a bermed or raised corner you can lean over and do not need as much traction, but a berm is just a dip on it’s side, and can be pumped through in the same way. There is more to the technique than just pushing down. See the instructions below to get you pump on. Get confident on each step before progressing to the next one. Soon you will be flying down the trail, leaving your mates wondering how you got so fast. To get started, find an empty parking lot or patch of grass. Don’t forget to bring your helmet along. Roll along at a steady pace with your pedals level with each other (one forward and one back). Squat down by bending your arms and legs, before using your hips and arms to drive your weight into the pedals and handlebars. As you do this, keep your heels down so your feet point slightly upwards, and rotate your wrists down. This ensures that the energy you are pushing into the bike propels it forwards and not just down. You should hear your tires buzz as you accelerate. 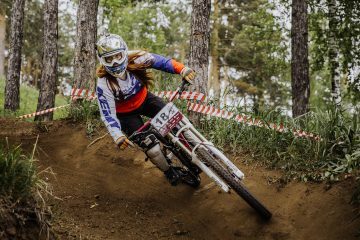 Once you have got used to how this feels, find a local pumptrack (see below) or section of trail with some small rises and dips. Roll into the section at the same speed as you practiced earlier and think about the basketball. Pump into the face and down-slope of each rise and pump down into dips. Your goal here is to maintain a constant speed without slowing down. Timing is crucial. Experiment with starting the pump earlier or later to see what effect this has on your speed. As you perfect the technique and timing, you will find that you can actually speed up through the section without pedalling. Free speed! 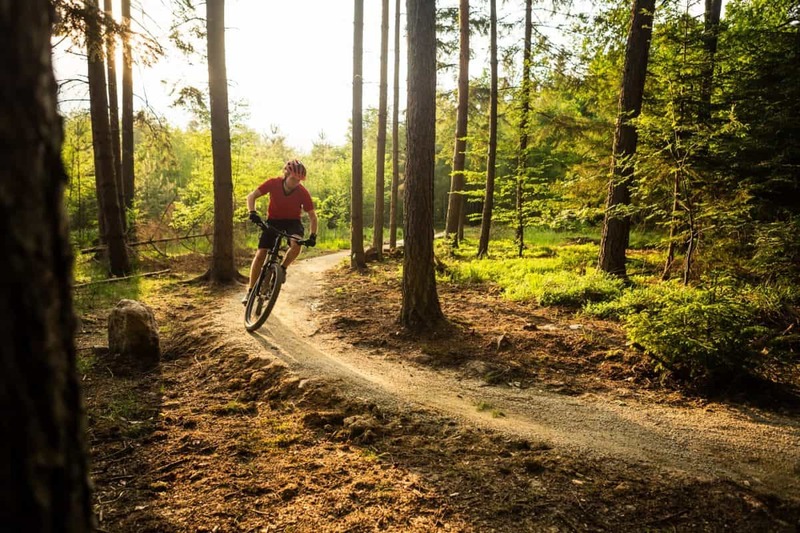 Find a wide turn, or ideally a long winding section of singletrack without roots or rocks. Use the same pump technique as you roll through each turn to drive the tires into the ground. The downward force will give you more traction, allowing you to corner faster and the harder you push with your legs, the more you will accelerate out of the turn. Find a wide and flat berm and turn your head to the side (to the left for a left-hand corner and vice versa). Notice how the berm now just looks like a dip in the trail? You have already mastered how to pump down into a dip, so do exactly the same as you roll through the berm. Pumping can also be used to help you get through rock gardens or piles of tree roots. Once you are comfortable with the technique, look out for features on the trail that you can pump off. 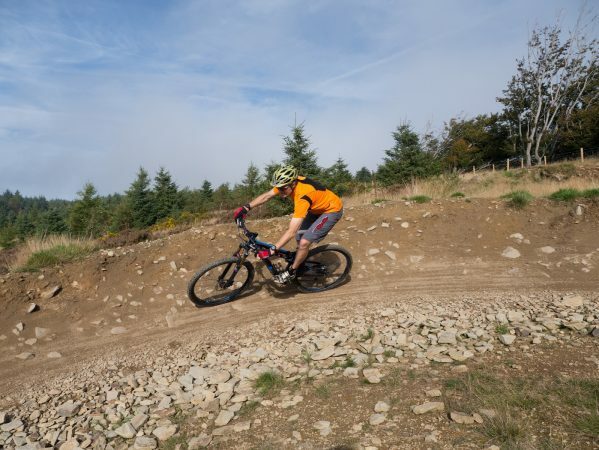 If there is a suitable rock at the start of a rock garden, pump off it and unweight your bike to make the wheels track over the rocks without throwing you around. You can do the same with a series of roots. 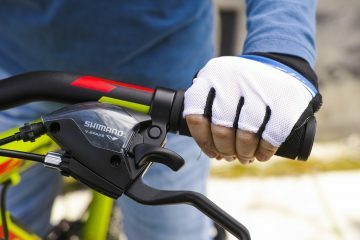 When you are feeling confident pumping over bumps on the trail, try pulling up on the handlebars as the front wheel reaches the top of the bump. As the back wheel reaches the top, push hard with your legs. With the correct timing you will send the bike into the air. 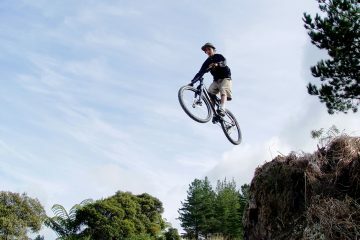 Pumping combined with the bunny hop technique is the basis for learning how to jump a mountain bike. A pumptrack is series of rollers (or bumps/rises) and bermed corners that goes round in a loop. As the name suggests, a pumptrack is the perfect place to learn how to pump. You can often find a pumptrack at your local dirt jumps or trail center. 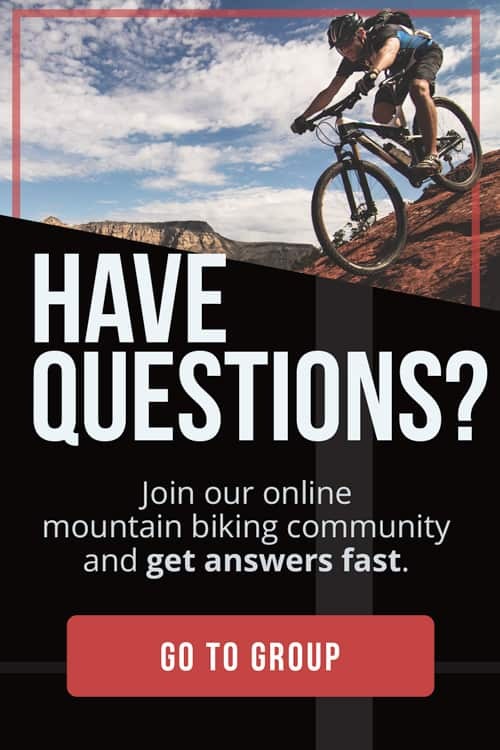 Try searching online to find one or ask your local bike shop. 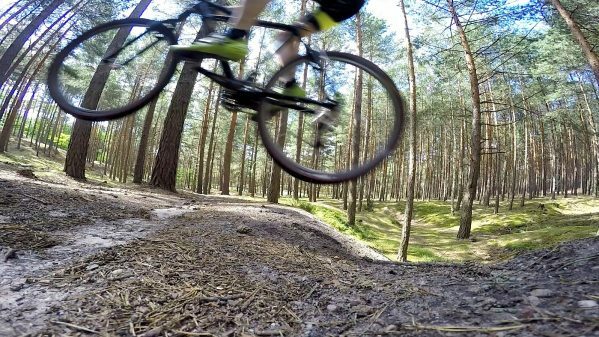 Spending time at a pumptrack is highly beneficial for a number or reasons. Not only is it a great place to practice pumping, you can also get a full body work out from pumping through as many circuits as possible. Pumptracks can be very sociable places where mountain bikers and BMX riders hang out. You can make new riding friends and watch them on the track as well as ask their advice on how to refine your technique. Finally, the features on most pumptracks can be rolled over by riders of all levels, so don’t be afraid of giving it a go. You can even take your kids with you! Have a look singletracks.com to learn more about pump tracks and how to ride them. If there is no pump track in your area then why not build one?